2017 – Latest update – the regions have been disbanded for this year and so athletes from the former South West area will be competing for either the Midlands or the South teams. Sonya will still be involved in supporting the Midlands team so please contact for details. 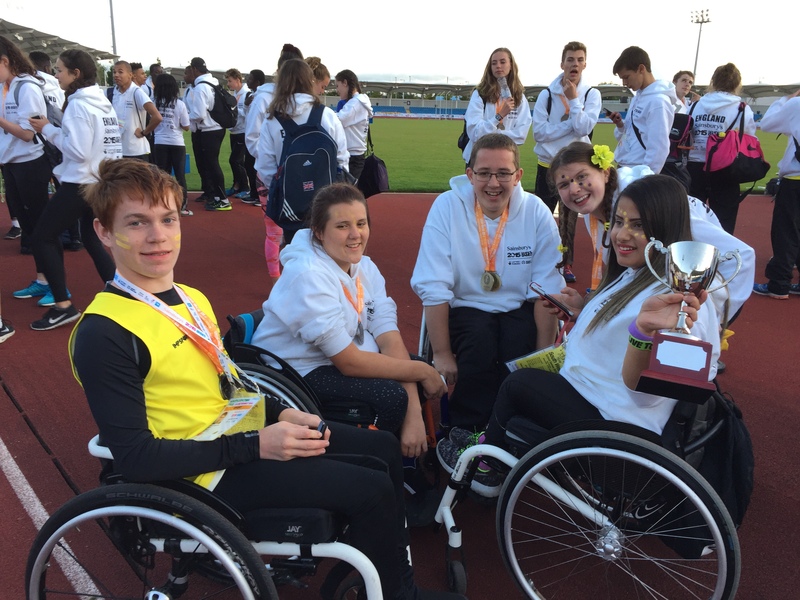 Once again the South West athletics team have had a successful showing at the Sainsburys 2015 School Games in Manchester organised by the Youth Sport Trust. The Team won the overall Trophy and were delighted with their results winning a record gold medals to secure their title. These games seek to create an inspirational and motivational setting that not only provides elite young sports people with the opportunity to thrive and perform at the highest levels, but encourages more young people to take part and succeed in sport. 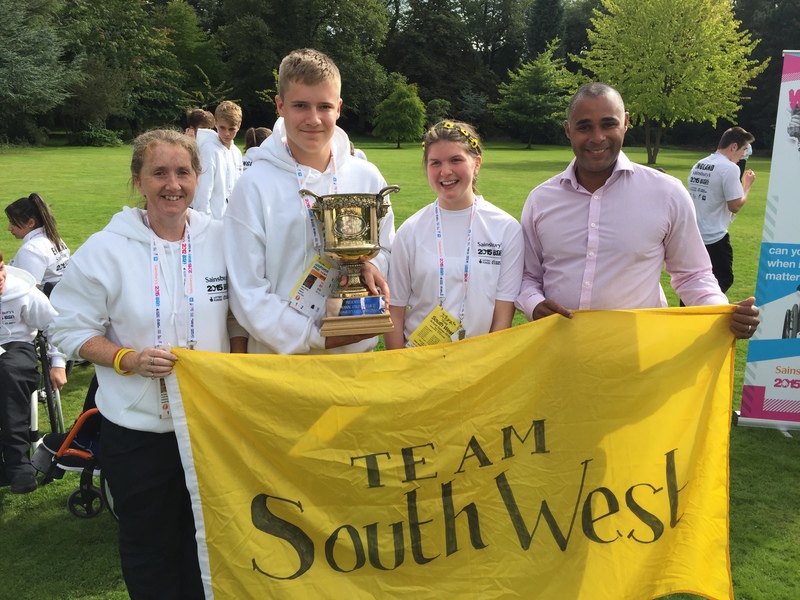 It was a double thrill for SW athletes who were presented with their winning trophy by Jason Gardener – former World Indoor Champion and Olympic Gold medalist. Jason a former Bath based and SW sprint athlete wanted to encourage the young people to focus on their training and compete at the highest level. 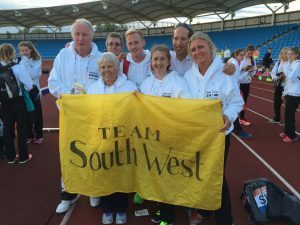 The SW team were ably supported by a team of south west volunteers led by Sonya Ellis as SW Team Manager. Sonya was supported by – Dave Turner – Avon , Stella Bacon – Berkshire, Elliot Prince – Gloucestershire, Glenn Etherington – Devon and formerly Channel Islands, Caroline Bird – Buckinghamshire, Keith Reid – Devon and Ken Holmes – Avon. Sonya said “I find it tremendously fulfilling volunteering at these events and I would like to thank the team who have been instrumental in ensuring that these young athletes have had such a positive experience of a national competition. Personally I find these national multi-sport events very exciting and it is such a thrill seeing young people achieve at competitions.” Sonya has been a regular volunteer in athletics for over 30 years with the pinnacle of her career being as a Gamemaker at both the Olympic and Paralympic Games. She would like to urge more people into volunteering so that the athletes of the future have high quality opportunities to do their best and succeed in their sport. 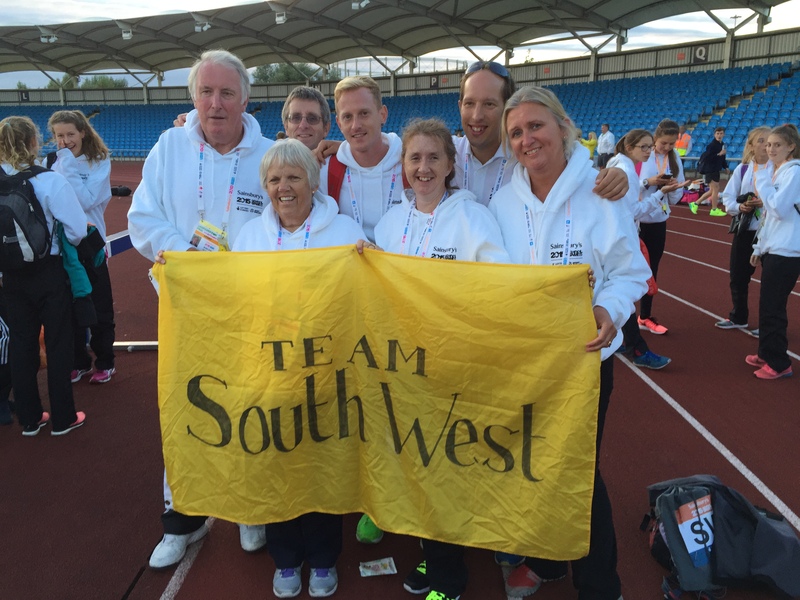 The South West team took part in the 2015 Sainsburys school Games in Machester in Septemer 2015. The team had some amazing results, but it came down to the last two events the 4x300 girls and 4x400 boys where they won both to secure the winning team position – something the team has not achieved before.